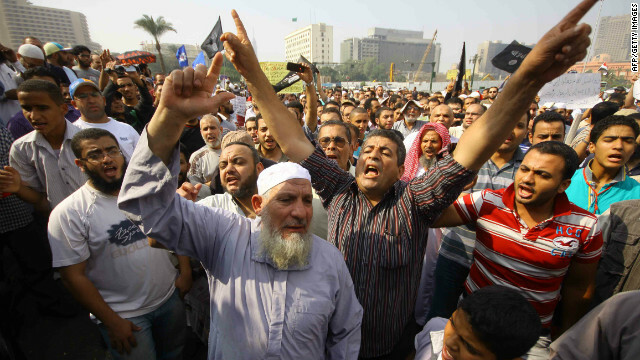 Salafists shout slogans demanding the implementation of the sharia in Cairo's Tahrir Square on November 2, 2012. (CNN) - Thousands of supporters of various Egyptian Salafi groups gathered in Cairo's Tahrir Square on Friday calling for the immediate implementation of Islamic law. Before midday prayers, speakers called on the government of President Mohamed Morsy to move quickly to implement Sharia. Morsy won the office as the candidate for the Muslim Brotherhood-affiliated Freedom and Justice Party. About 10,000 demonstrators advocating for Sharia filled the square, chanting in unison, "The people want God's law applied." Look at them well xtian fundies, because they are the brown skinned version of you and what you want to do to this country. Look at all the women in that crowd! They seem to want sharia at least as much as the Iranian mobs did back in the '70's. May they get their plates ever fuller of sharia then even Iran, and may they choke on it and come to regret the choice even more than the Iranian people do now.